Do not worry at all, we are here to do good cure of your illness and pains. No matters if it belongs to yourself, your spouse or your child. Thumbay Clinic is a network of state-of-the-art family clinics set up as part of Thumbay Group’s endeavors to deliver high-quality healthcare at affordable costs. Each Thumbay Clinic is designed as a one-stop destination to provide complete medical care for families and individuals of all ages. At Thumbay Clinic, we are committed to delivering continuous and comprehensive medical care to our patients at all times. Our doctors, nurses and staff are drawn from extensive medical backgrounds and are experts in caring for the entire family. Thumbay Clinics extend you a range of specialties and services including General Medicine, ENT, Pediatrics, Cardiology, Ophthalmology, General Surgery, Radiology, Gynecology, Orthopedic, Dermatology, Pharmacy, Insurance, Diagnostics etc. The clinics also act as referral centres for the Thumbay Group hospitals. As a network of family clinics focusing primarily on personalized services, convenience and affordability, Thumbay Clinics deliver patient-focused, high-quality, cost-effective healthcare at your doorsteps. Our premium facilities offered make us one of the finest community health care providers. All major insurance companies are honored by us. 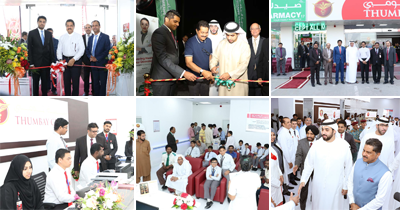 The entire network of Thumbay hospitals and clinics is affiliated to Gulf Medical University and also offer teaching and training facilities to its students. Presently located at Ajman, Sharjah, Dubai, Fujairah, Ras Al Khaimah and Umm Al Quwain, Thumbay Clinic is a network of family clinics offer services ranging from outpatient care to the latest medical procedures and diagnostics. Thumbay Clinics offer premium facilities that make them one of the finest community healthcare providers. All major insurance companies are honored at all Thumbay Clinics. The entire network of Thumbay academic hospitals and clinics provide teaching and training facilities to the students of Gulf Medical University – Ajman, one of the leading private medical universities in the region owned and operated by Thumbay Group.